Elisabeth Noelle grew up with her elder sister Gisela and her two younger brothers Ernst and Dieter in the house of her parents at Limonenstrasse 8 in Berlin Lichterfelde on the border to Berlin Dahlem, where the family had moved in March 1917.1)Family chronicle by Eva Noelle, Private Archives Elisabeth Noelle, Piazzogna. In October 1922, she attended the private school Kockert, and from 1926, she went to the Auguste-Viktoria-Lyzeum (high school) in Berlin Steglitz.2)Phil. Fak. 915, Promotionen, p. 59, Archives of the Humboldt-University Berlin. Well – now you won’t know right away who is writing here to you, and when you take a look at the signature, you won’t be any smarter. Of course not! For you don’t know me and I don’t know you either, that is: I have seen a picture of you in the magazine ,Funkstunde‘. It attracted my attention because what they usually serve you there are important-looking, bald old men or dancing girls with perms. Hoerschelmann replied, the epistolary exchange soon became very personal, and two years later, the two met for the first time in Berlin. Looking back on the beginning of their friendship, Hoerschelmann wrote many years later:4)Letter from Fred von Hoerschelmann to Elisabeth Noelle-Neumann, Tuebingen, February 28, 1955, Private Archives Elisabeth Noelle, Piazzogna. From the beginning, a personal relationship developed. But within this relationship you have always been for me the more finely organized being. You have always been MORE. There was, right from the start, your incomparable intensity, your vital perseverance, your instinctive ability to forge a life style – later, there was in addition the whole intelligible complex, the speed and accuracy of your thought. And where did you find this incomprehensible certainty with which you chose from what was available exactly what you needed, excluding at the same time what bothered you? The friendship between the two expressed itself in a correspondence of around a thousand pages that only ended when Hoerschelmann died in 1976.5)The correspondence is kept partly in the Literaturarchiv Marbach, partly in the Private Archives Elisabeth Noelle, Piazzogna. And from there I strode out, I knew that all alone I did not feel well, therefore I was looking for interesting people to exchange views with. But because this was very difficult, I founded a newspaper where young people aged 12-22 were supposed to write. All that worked out wonderfully, I ended up having 150 people, including many adults and some journalists, soon replies and ripostes were printed in my newspaper, and when the parties could not agree, they were all invited to my home. In this way, I became acquainted with my collaborators insofar as they lived in Berlin. Often they were very interesting and gifted. Last Easter  I gave up the newspaper but stayed in touch with many people. In this way, I also entered a Russian circle and felt for the first time really well. I worked little for school but had a lot of other interesting things to do. My independence in thought and behavior did not please my parents, maybe because my take on many things was opposed to theirs. I don’t have any independence here – no private life, you are not even safe from their opening your letters – that is why I have to seal this one too. As to Salem, she disliked from the outset the obligation to wear a school uniform.9)Letter from Elisabeth Noelle to Fred von Hoerschelmann, Berlin, December 23, 1932, Private Archives Elisabeth Noelle, Piazzogna: „Moreover you are ...continue Regarding the progressive educational program of Salem, she remarked in a letter to Fred von Hoerschelmann written on January 30, 1933 – the day of the so-called „seizure of power“ of the National Socialists:10)Letter from Elisabeth Noelle to Fred von Hoerschelmann, Spetzgart, January 30, 1933, Private Archives Elisabeth Noelle, Piazzogna. This is a school that wants to propagate the real German spirit and everybody who is educated here is supposed to propagate it later on in Germany. That is not exactly suitable for me because I am not in the least patriotic. And I find it difficult anyway to take seriously all those fancy methods of “soul education”. In the same letter, she also laid out where she located herself politically. About one year earlier, as a 15-year-old, she had been „very enthusiastic“ about the National Socialists in view of the „fabulous recovery“. However, when she had read the party program and discussed it with her father, she had detected „numerous errors“ in it. She concluded:11)Letter from Elisabeth Noelle to Fred von Hoerschelmann, Spetzgart, January 30, 1933, Private Archives Elisabeth Noelle, Piazzogna. If I had to elect, I would vote for a moderately right party that leaves you more or less in peace so that you can lead your life as you please without being meddled with by the „government”. Both in the Reinhardswald school and in Salem, Elisabeth Noelle tried to make the best of her situation,12)Letter from Elisabeth Noelle to Fred von Hoerschelmann, Berlin, December 23, 1932, Private Archives Elisabeth Noelle, Piazzogna: „The wise lesson: ...continue and in retrospect the positive memories of that time prevailed.13)Cf. : Elisabeth Noelle-Neumann: Die Erinnerungen (pp. 31-37). Herbig, Munich 2006. Among the positive experiences were the friendships with Rosemarie Nicolaja und Joerg Jensen – Elisabeth Noelle stayed in close touch with both of them throughout her life. Joerg Jensen became her first boyfriend and they moved together into a blockhouse in Obermenzing near Munich when they were studying there in 1936/37. Even when they separated and Joerg moved to the U.S. after the war, they always stayed in touch.14)The correspondence with Joerg Jensen is kept in the Private Archives Elisabeth Noelle, Piazzogna. Rosemarie Nicolaja, whose family was of Jewish descent, later married the Romanian diplomat Radu Coutzarida, a great-grandchild of the composer Franz Liszt.15)Letter from Elisabeth Noelle to Fred von Hoerschelmann, Cairo, November 13, 1938: „(…) he [Radu Coutzarida] appears to me all of a sudden ...continue Rosemarie Coutzarida lived in turn in Romania, Egypt, Argentina, and France, where she always kept touch with Elisabeth Noelle-Neumann.16)The correspondence with Rosemarie Coutzarida is kept in the Private Archives Elisabeth Noelle, Piazzogna. As I already mentioned to you, I was almost forced to leave this school. But it then went quite peacefully – the final result of my discussion with the principal was: That it would be better for me and the private school if I left because I am too mature. And she is right about it – for you have to be very malleable and immature to fit into this Salem school, to approve of it wholeheartedly. During her studies at the two private schools, Elisabeth Noelle had considered leaving school ahead of schedule and applying for work at a newspaper because she was determined to become a journalist. Thereupon, her father asked a friend of his, the editor Heinz Ullstein,20)Heinz Ullstein (1893-1973) was one of 12 grandchildren of Leopold Ullstein, founder of the Ullstein Publishing House. At the age of 32, Heinz ...continue to discuss career plans with his daughter. Ullstein received the schoolgirl in his office at Kochstrasse in Berlin and encouraged her to become a journalist. 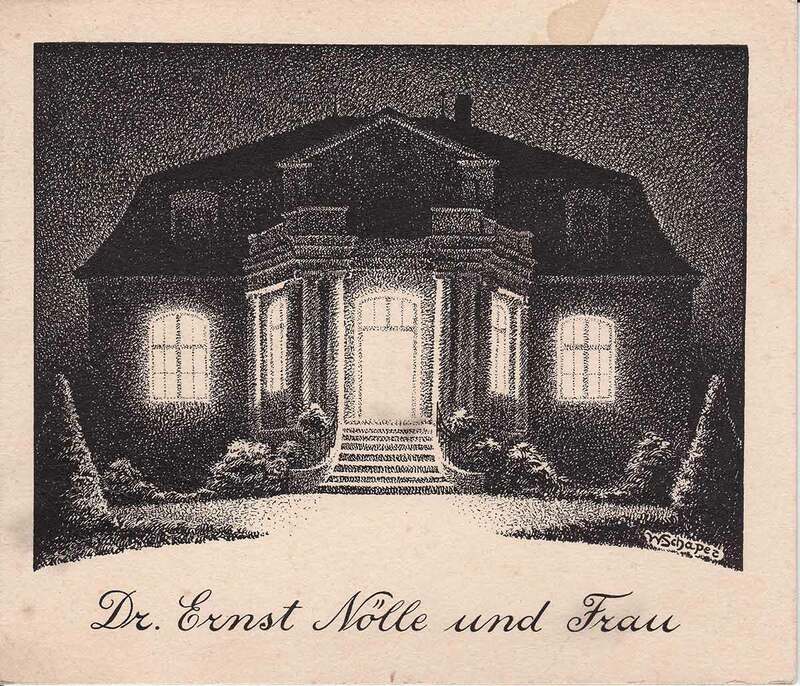 At the same time, he advised her to finish high school with the “Abitur” because she would need that qualification to become a journalist, especially as a woman.21)The contact with Heinz Ullstein and his advice are mentioned in: Letter from Ernst Noelle to Elisabeth Noelle, Berlin, July 21, 1933. Private ...continue Following Ullstein’s advice, she decided to finish high school in order to obtain her „Abitur“. Several decades later, Heinz Ullstein still recalled counseling the schoolgirl Elisabeth Noelle:22)Letter from Heinz Ullstein to Elisabeth Noelle-Neumann, Frankfurt/Main, June 22, 1964. Private Archives Elisabeth Noelle, Piazzogna. You were probably my first success in that field. In the meantime, I have kept many young girls, including seven wards, from taking false decisions and engaging in false love affairs. With boys I would probably not have been that lucky. With them I did not even try in the first place. At the end of August 1933, Elisabeth Noelle moved to Goettingen, where her aunt Dorothea Barthels geb. Schaper and Joerg Jensen’s family lived. She stayed in the house of rear admiral Wilhelm Adelung and his wife Margarete,23)Cf. : Letter from Elisabeth Noelle to Gisela Noelle, Goettingen, February 8,1934, Private Archives Elisabeth Noelle, Piazzogna: „At Dad’s wish Mum ...continue who ran a small guesthouse for students,24)Cf. Letter from Mrs Adelung to Eva Noelle, Goettingen, Januar 19, 1934, Private Archives Elisabeth Noelle, Piazzogna. attended the city “Oberlyzeum” (academic high school), and graduated with the “Abitur” in 1935 obtaining the mention „good“.25)Family chronicle by Eva Noelle, Private Archives Elisabeth Noelle, Piazzogna. In hindsight, her last school year appeared to her as the luckiest of all:26)Letter from Elisabeth Noelle to Eva Noelle, Munich, December 5, 1936, Private Archives Elisabeth Noelle, Piazzogna. When I think back of school, I always think only of the ideal image of the last year, and that lets me forget all the dry and gulped-down schooldays… in the last class, the questions woke up, the thirst for knowledge arose, which should later always remain the driving force. Elisabeth Noelle also participated in the extramural students’ life and in this way met two physics students, Peter Pringsheim and Heinz Maier-Leibnitz. After graduating from high school in March 1935, she went skiing with Peter Pringsheim in Zuoz in Switzerland.30)Letter from Elisabeth Noelle to Eva Noelle, Goettingen, February 16, 1935, and letter from Elisabeth Noelle to Eva Noelle, Goettingen, undated, ...continue His father Fritz Pringsheim,31)Fritz Pringsheim was a cousin of Alfred Pringsheim, father of Katja Mann, Thomas Mann‘s wife. See: Hans Maier: Böse Jahre, gute Jahre: Ein ...continue a law professor in Freiburg, was forced to resign in this year because his family was of Jewish descent – as a veteran of World War I, he had at first been spared from this discriminative measure. After being temporarily arrested in the concentration camp Sachsenhausen in 1939, he emigrated to Oxford. Heinz Maier-Leibnitz, who became Elisabeth Noelle-Neumann’s second husband in 1978, was a Ph.D. student of the Nobel-prize winner James Franck, who supervised his thesis from Copenhagen in Denmark.32)Anne-Lydia Edingshaus: Heinz Maier-Leibnitz. Ein halbes Jahrhundert experimentelle Physik (pp. 42-47). Piper, Munich 1986. Franck – just like Pringsheim of Jewish descent – was, at first, not removed from his position as a professor because of the so-called „privilege“ for World War I veterans. In April 1933, however, he vacated his professorship to protest against the discrimination of Jews in Germany. During the winter term 1933/34, Franck accepted a guest professorship at the Johns-Hopkins University in Baltimore, and subsequently emigrated to Denmark. 1, 25. ↑ Family chronicle by Eva Noelle, Private Archives Elisabeth Noelle, Piazzogna. 2. ↑ Phil. Fak. 915, Promotionen, p. 59, Archives of the Humboldt-University Berlin. 3. 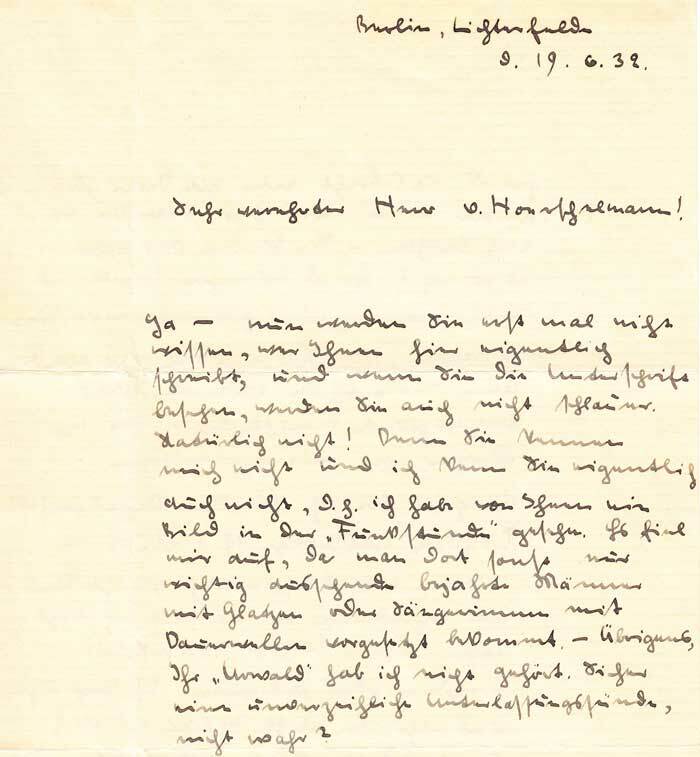 ↑ Letter from Elisabeth Noelle to Fred von Hoerschelmann, Berlin, June 19, 1932. Private Archives Elisabeth Noelle, Piazzogna. 4. ↑ Letter from Fred von Hoerschelmann to Elisabeth Noelle-Neumann, Tuebingen, February 28, 1955, Private Archives Elisabeth Noelle, Piazzogna. 5. ↑ The correspondence is kept partly in the Literaturarchiv Marbach, partly in the Private Archives Elisabeth Noelle, Piazzogna. 6. ↑ Letter from Elisabeth Noelle to Fred von Hoerschelmann, Reinhardswald school near Kassel, October 24, 1932, Private Archives Elisabeth Noelle, Piazzogna. 8. ↑ Letter from Elisabeth Noelle to Fred von Hoerschelmann, Reinhardswald school near Kassel, September 8, 1932, Private Archives Elisabeth Noelle, Piazzogna. 10, 11. ↑ Letter from Elisabeth Noelle to Fred von Hoerschelmann, Spetzgart, January 30, 1933, Private Archives Elisabeth Noelle, Piazzogna. 13. ↑ Cf. : Elisabeth Noelle-Neumann: Die Erinnerungen (pp. 31-37). Herbig, Munich 2006. 14. ↑ The correspondence with Joerg Jensen is kept in the Private Archives Elisabeth Noelle, Piazzogna. 16. ↑ The correspondence with Rosemarie Coutzarida is kept in the Private Archives Elisabeth Noelle, Piazzogna. 18. ↑ Elisabeth Noelle-Neumann: Die Erinnerungen (p. 33). Herbig, Munich 2006. 19. ↑ Brief von Elisabeth Noelle an Fred von Hoerschelmann, Spetzgart, 21. Juni 1933, Privatarchiv Elisabeth Noelle, Piazzogna. 20. ↑ Heinz Ullstein (1893-1973) was one of 12 grandchildren of Leopold Ullstein, founder of the Ullstein Publishing House. At the age of 32, Heinz Ullstein started to work for the Ullstein company, four years later he was elected as member of the supervisory board. Because his family was of Jewish descent, he was arrested in 1943 and drafted for forced labor under the National Socialist regime. After the war, he reestablished the Ullstein Publishing House, which was later taken over by Axel Springer Publishers. 21. ↑ The contact with Heinz Ullstein and his advice are mentioned in: Letter from Ernst Noelle to Elisabeth Noelle, Berlin, July 21, 1933. Private Archives Elisabeth Noelle, Piazzogna. 22. ↑ Letter from Heinz Ullstein to Elisabeth Noelle-Neumann, Frankfurt/Main, June 22, 1964. Private Archives Elisabeth Noelle, Piazzogna. 24. ↑ Cf. Letter from Mrs Adelung to Eva Noelle, Goettingen, Januar 19, 1934, Private Archives Elisabeth Noelle, Piazzogna. 26. ↑ Letter from Elisabeth Noelle to Eva Noelle, Munich, December 5, 1936, Private Archives Elisabeth Noelle, Piazzogna. 27. ↑ Following a dispute with Martin Heidegger, Eduard Baumgarten abandoned his project of „habilitation“ with him at the University of Freiburg and accepted a position as lecturer at the University of Goettingen. Heidegger tried to torpedo Baumgarten’s academic career in Goettingen by stating in an expert report that Baumgarten stemmed “in terms of kinship and attitude from the liberal-democratic circle of intellectuals around Max Weber in Heidelberg”, adding that he was “everything else but a national-socialist”. Moreover, Heidegger reproached Baumgarten to be in “very lively” contact “with the Jew Fraenkel, formerly in Goettingen and now removed from his position”. Heidegger’s expert report was interpreted as “hateful” by the faculty in Goettingen and dismissed as “useless”. Baumgarten later adhered to the National-Socialist German Association of University Teachers, became assistant professor for philosophy at the University of Goettingen in 1937, and was finally nominated full professor for philosophy at the Albertina University in Koenigsberg. See: Carsten Klingemann: Soziologie im Dritten Reich (pp. 179-186). Nomos, Baden-Baden 1996; Ruediger Safranski: Ein Meister aus Deutschland – Martin Heidegger und seine Zeit (pp. 318-319). Hanser, Munich/Vienna 1995. 28. ↑ Elisabeth Noelle-Neumann: Die Erinnerungen (p. 38). Herbig, Munich 2006. 30. ↑ Letter from Elisabeth Noelle to Eva Noelle, Goettingen, February 16, 1935, and letter from Elisabeth Noelle to Eva Noelle, Goettingen, undated, Private Archives Elisabeth Noelle, Piazzogna. 31. ↑ Fritz Pringsheim was a cousin of Alfred Pringsheim, father of Katja Mann, Thomas Mann‘s wife. See: Hans Maier: Böse Jahre, gute Jahre: Ein Leben 1931ff (p. 85). C.H. Beck, Munich 2011. 32. ↑ Anne-Lydia Edingshaus: Heinz Maier-Leibnitz. Ein halbes Jahrhundert experimentelle Physik (pp. 42-47). Piper, Munich 1986.